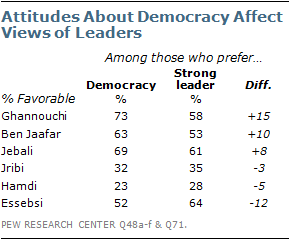 Tunisians hold positive opinions of their current leadership, their ruling political party, and their military. Prime Minister Hamadi Jebali, Ennahda co-founder Rached Ghannouchi, and current President of the Constituent Assembly Mustapha Ben Jaafar all have majority support from the Tunisian people. The leading coalition party in the Assembly, the moderate Islamist group Ennahda, also garners a positive majority. At the same time, the military is the most trusted institution in Tunisia, with near unanimous praise for its effect on the country. Two-thirds have a favorable view of Ennahda leaders PM Hamadi Jebali and Rached Ghannouchi, making them the most popular politicians polled in Tunisia.4 Ettakatol party leader Mustapha Ben Jaafar and independent Beji Caid Essebsi, interim prime minister from February to December, 2011, are also popular, drawing majority support from Tunisians (58% and 56%, respectively). Hachmi Hamdi, a journalist and the leader of Aridha Chaabia (i.e. Popular Petition Party), is the least-popular politician tested. 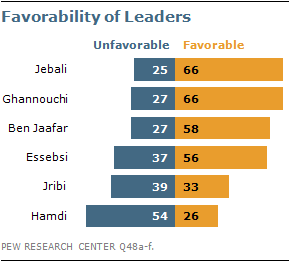 Only 26% see him favorably, while over half (54%) have an unfavorable view of the politician who many believe has close ties to ousted former President Zine el-Abidine Ben Ali. Positive ratings of these politicians are related to views of democracy. Tunisians who favor democracy over a strong leader give the scholar-politician Ghannouchi a 73% positive rating, while only 58% of those who favor a strong leader agree. On the other hand, 64% of Tunisians who prefer a strong leader have a favorable view of former Prime Minister Essebsi, while roughly half (52%) of those who choose democracy say the same. The ruling moderate Islamist party Ennahda receives strong support from the Tunisian people. Nearly two-thirds (65%) have a favorable view of the Assembly’s leading party, while only three-in-ten have an unfavorable view. Ennahda’s more secular coalition partners, Congress Party for the Republic (CPR) and Ettakatol (FDTL), garner notably less support – 48% and 44% of Tunisians have favorable views of these parties, respectively. However, more educated Tunisians have a sunnier view. For example, 57% of Tunisians with a college degree have a favorable view of Ettakatol, while only 38% with primary schooling or less feel the same. Tunisians have more negative views of other major parties in the assembly. The Progressive Democratic Party (PDP), which recently merged with other centrist parties to form the Republican Party, is seen favorably by only 31% of Tunisians and unfavorably by 45%. Meanwhile, majorities have a negative view of Aridha Chaabia, a populist leaning party, and the Tunisian Workers Communist Party (PCOT). 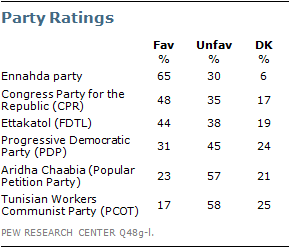 Only about one-in-five Tunisians have a favorable view of either Aridha Chaabia (23%) or PCOT (17%). The military is far and away the most popular of the leading institutions tested in Tunisia, with 97% saying it is a good influence on the way things are going and almost three-quarters (72%) saying it is a very good influence. 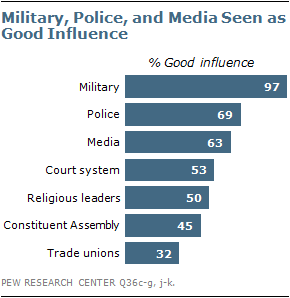 Majorities also see the police and media positively (69% and 63% respectively). On balance, Tunisians say the court system (53%) and religious leaders (50%) are a good influence on the country, but opinions about the Constituent Assembly (NCA), which is charged with writing Tunisia’s new constitution, are more divided. An almost equal number of Tunisians say the Assembly is a positive influence (45%) as say it is negative (47%). Meanwhile, trade unions are seen negatively – only 32% say they are a good influence on the country and half say they are a bad influence. In addition, views of the Assembly are shaped by religiosity and commitment to democracy. Roughly half (49%) of Tunisian Muslims who pray five times per day have a favorable view of the Assembly, but only 37% who pray less than that agree. And half of Tunisians who prefer democracy to a strong leader say the Assembly is a good influence, while only 38% of those who prefer a strong leader say the same.